Near Boardwalk! Big Luxury Condo w/ Pool, Free Wi-Fi, & Great Sunsets! PLEASE NOTE: This property does not allow group rentals to guests under age 25. Therefore, online bookings for group rentals will not be honored. This property is only available for a weekly rental with a Saturday check-in dates and FlexStay (check-in any day of the week - 3 or 4 night minimum) during the off-season. Pick your own check-in and check-out days. We have stayed a couple of times at this rental home! We are a family of 5, and we normally feel crowded wherever we stay, but not here! 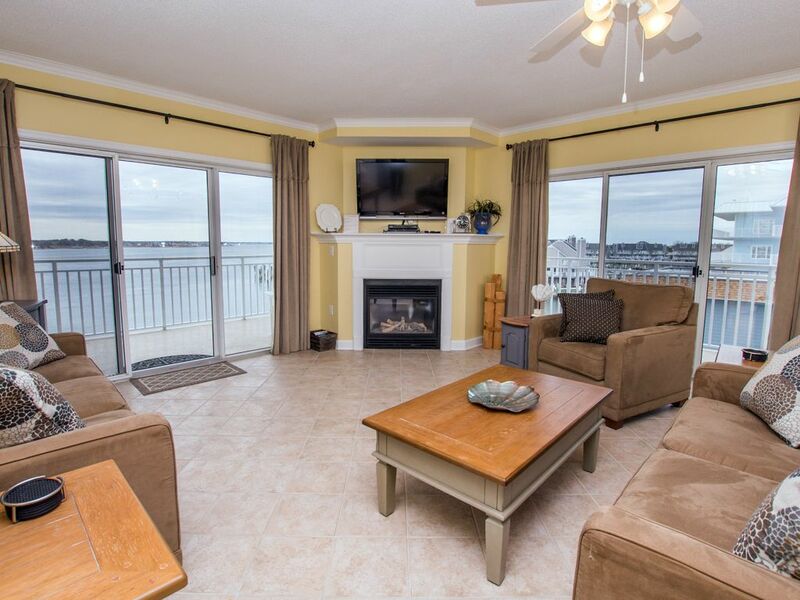 This condo is spacious, well appointed, and we absolutely feel like we are on vacation! It's close to the beach, restaurants, things to do, but still tucked away enough to feel private. Thank you for opening your home to us, we would love to stay again! We like to think of this beautifully maintained and very well appointed property as our home away from home! Our kids actually call it "our beach house" and are always excited to return. It offers a great central location with a short walk to the boardwalk and easy access to some of our favorite activities from mini golf to breakfast at Layton's. It's a quick drive to the beaches and wild horses of Assateague as well as great outlet shopping. We love watching all the activity on the bay and the gorgeous sunsets from the enormous and comfortable wrap around deck. The kids also love having a pool on site. It is obvious that the owners take great pride in this condo and that they want their renters to feel right at home. We plan to enjoy it again and again! Bahia Vista (11th St) is a beautiful, Bay Front community with luxurious accommodations & amenities. Located just 4 blocks from the Beach & Boardwalk, this property offers you the best of both worlds: a quiet, Bayside setting with all of Ocean City's fun & excitement right at your fingertips. Many great shops, activities & restaurants are within walking distance, including Pickle's Pub (locals' favorite! ), Pizza Mambo, Candy Kitchen & more!